Since medieval times, the Donjon tower of the Valkhof fortification defined the skyline of Nijmegen. In 1794 the fortification was largely demolished, to make way for a park. 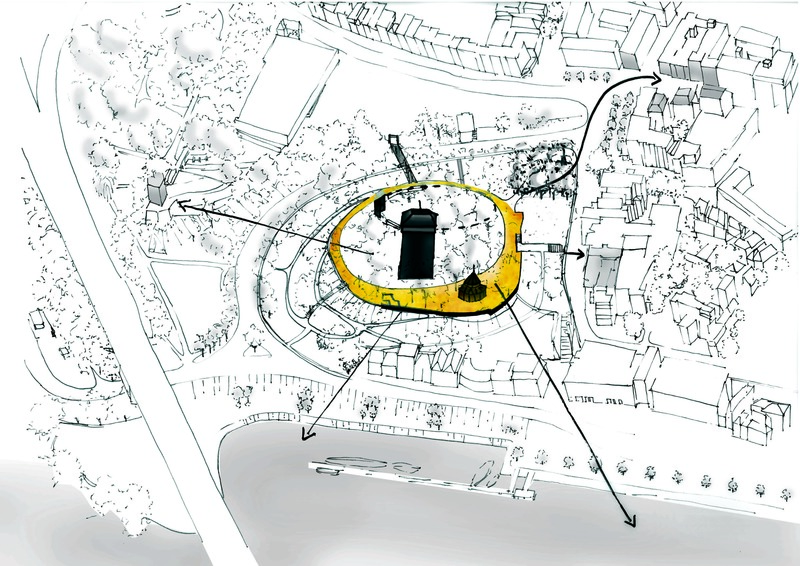 The Donjon Nijmegen Foundation is committed to rebuilding the historical super tower. 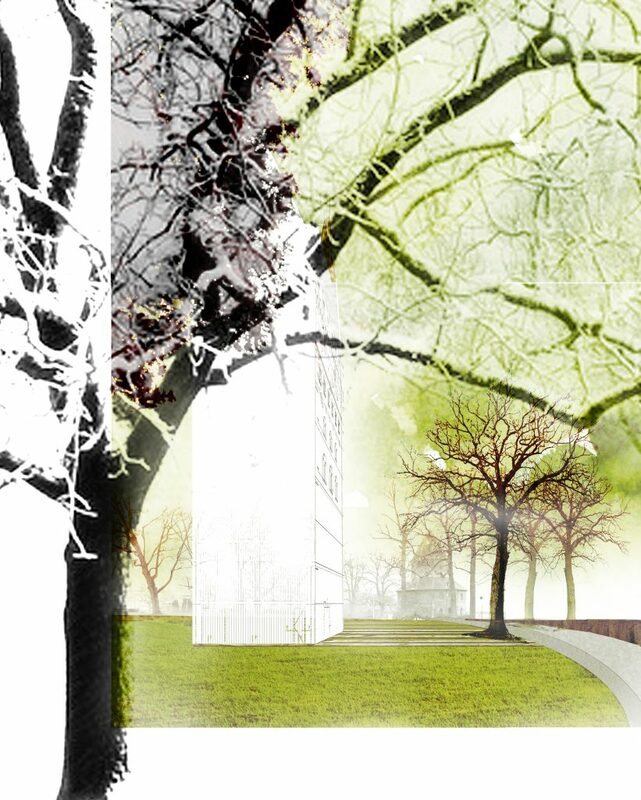 Bureau B+B made a design for the scenic integration of the tower and the renovation of the park. Finding a balance between the monumental character of the park and its importance as an event venue was an important part of the assignment. The history of Nijmegen´s Valkhof Park goes back millennia. The hill of the Valkhof has been used as a strategic viewpoint by Romans, Batavians and Merovingian rulers. Ancient archeological relicts shape the identity of the Valkhof Park. As a consequence, they are carefully preserved. They will regain the prominence they deserve: redundant planting and other obstacles will be removed. The new Donjon will also hold a prominent position in the middle of the plateau. The path system will be drastically reduced in order to accentuate the relicts. Despite all these archeological values, the Valkhof Park will not be turned into a museum. The park must remain an important place for recreation and events such as the Four Days March. 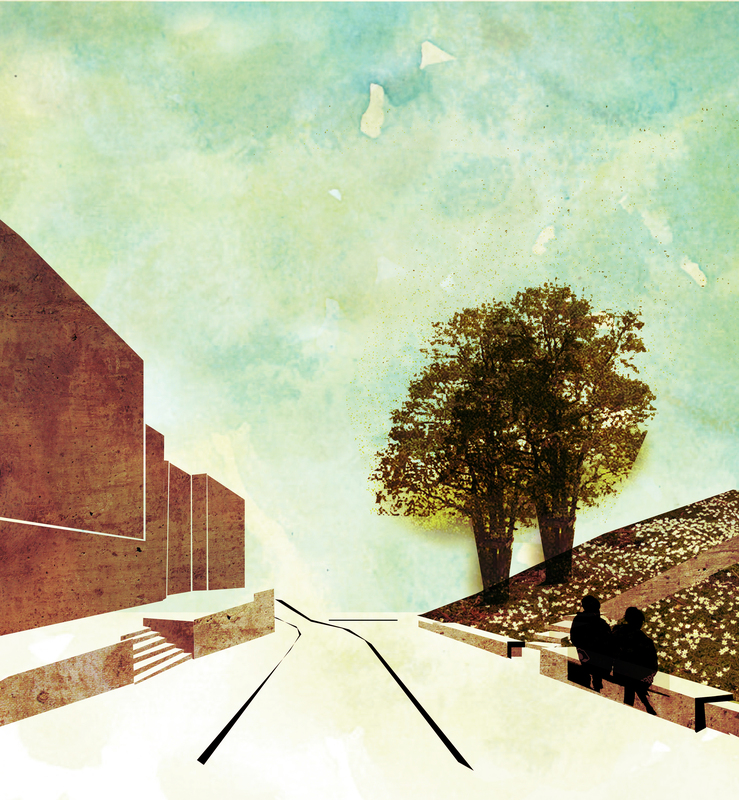 Since 1794, the Valkhof park has been designed and redesigned by different designers. 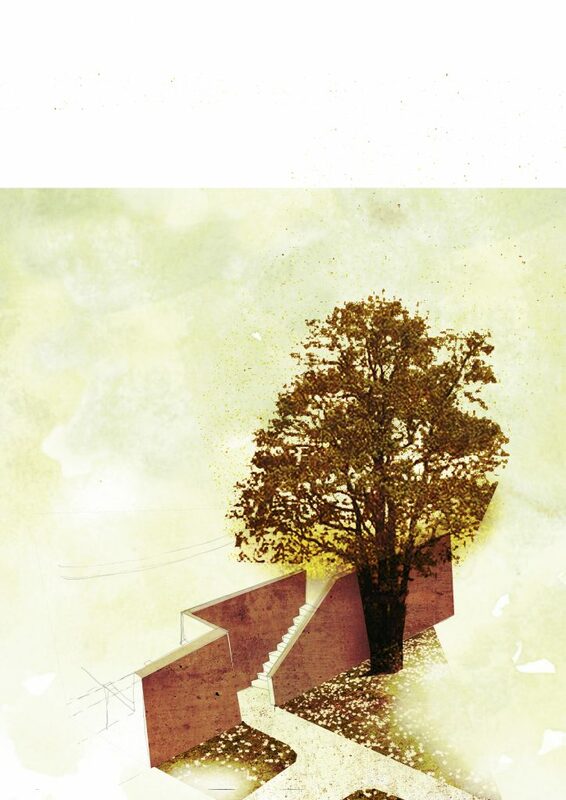 Every design is a reflection of the ideas on landscaping of that period. The first design was made by Zocher senior. It is a typical early English garden with a clear lay-out. Thirty years later van Lunteren added extra winding pathways, in accordance with the development of the English garden style, so that people could parade around more intensively. In 1880 Rosseels connected the park to the adjacent Hunnerpark. The last transformation took place in 1980, by city architect Roukema. 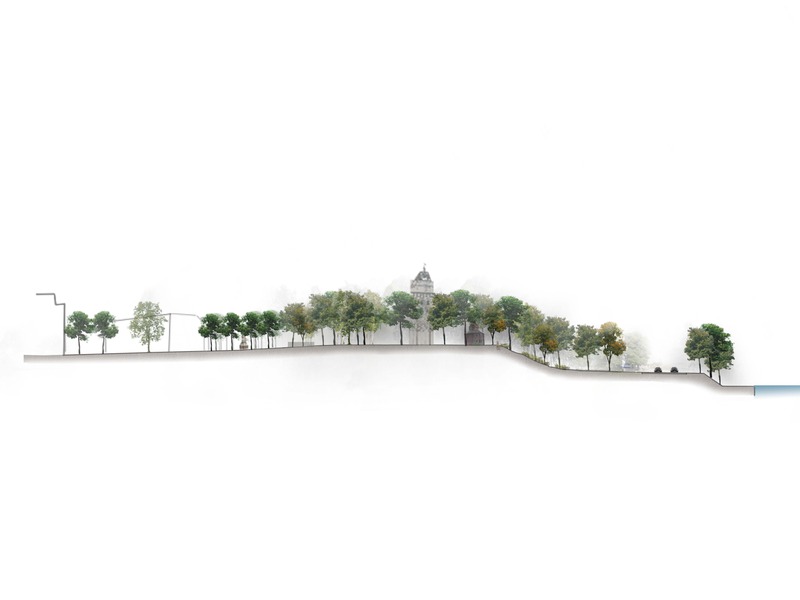 Together, the four successive designs create the foundation for our new interpretation of the park. 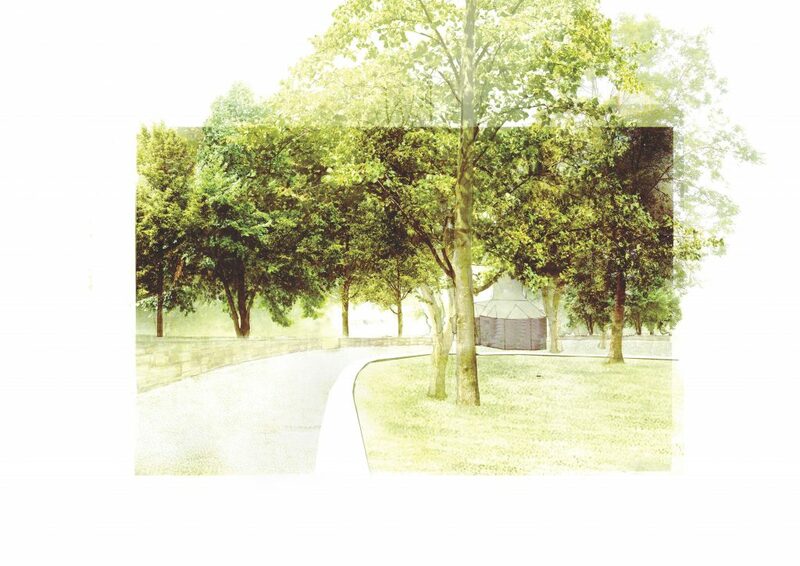 We will not try to recreate a certain historical style of landscaping, but we will create a framework that recognizes the many historical layers present in the Valkhof Park. Today, Valkhof Park is faced with worn paving, incoherent furniture, bland planting, cluttered views and unclear entrances. 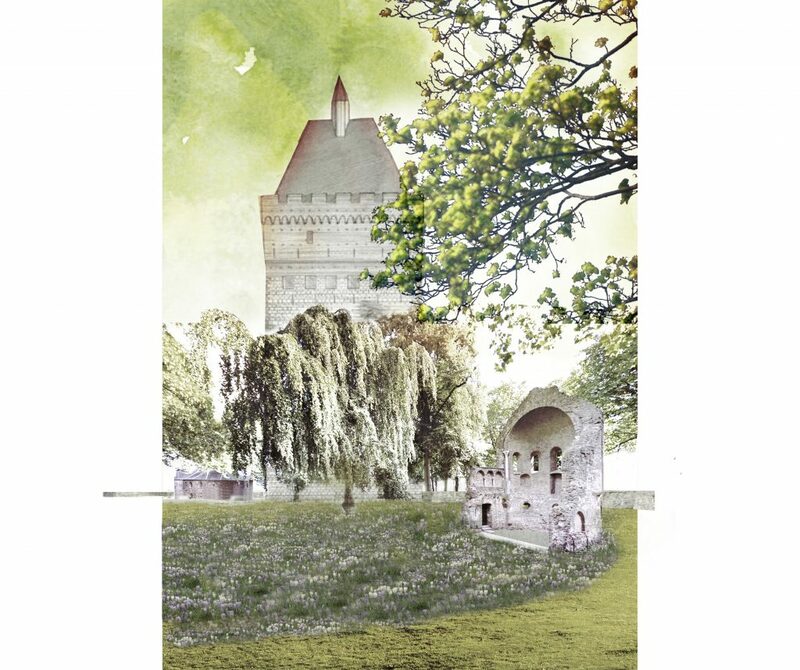 The reconstruction of the Donjon allows the opportunity to renovate the park. The path structure will be simplified. The circumambulation from Zochers original design will be recovered. This enhances the visibility of the archeological relicts. At the same time, a large central area is defined for events or contemplation. 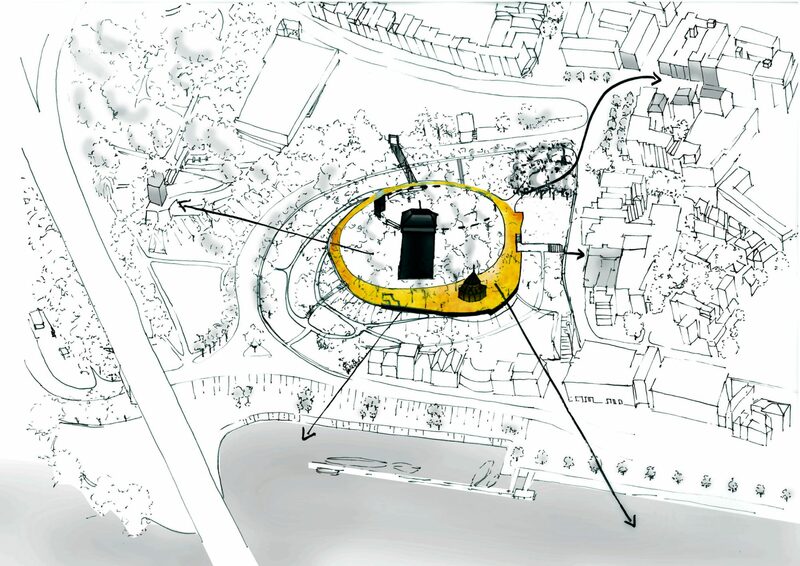 All design interventions are aimed at supporting this focus on the relicts and the experience of the plateau: For instance, there is a concrete ridge running along the circumambulation, that follows the undulating ground surface. At certain points, this ridge has just the right height to sit on, making additional seating unnecessary. The valuable monumental trees will be preserved. We enhance the introverted character of the stronghold on the north side. The entrance on the city side will function as a forecourt again. The Valkhof Park is a popular event location. As early as the nineteenth century, concerts were organized, today, the park is especially known for the Four Day March celebrations. These events are fundamental for the life of the park, but they also pose a threat to the monumental trees and the archeology. To prevent disruption of the roots of the trees and the archeological remains underground, every intervention has to be thought out to the last millimeter. We designed a set of rules for the construction and supply of the events to minimize damage to the park. By simplifying the path structure and reintroducing the circumambulation, a subtle zoning is created. Most activity will take place around the circumambulation.